goal: to take the design and copy of a printed brand book and reflect that to a webpage that informs internal and external audiences about the new dart branding. goal: to design a large tabletop prism that displays the three ways people can be involved with girl scouts: as a girl member, a volunteer, or a donor. 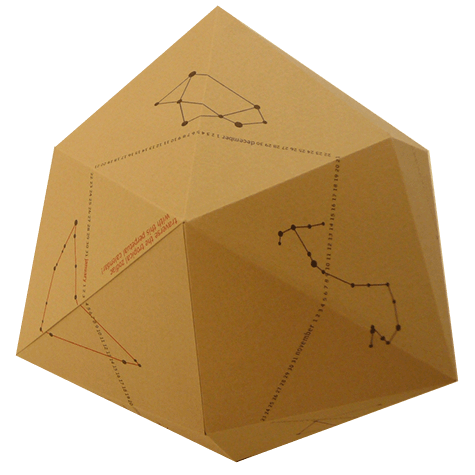 goal: to create a perpetual calendar that also teaches the person which constellation is visible in the night sky and its position on the celestial equator. goal: to create a lively and cohesive brand and site that seamlessly ties all digital platforms that showcases the variety of products and eases steps to purchase products. goal: to create an educational and interactive space geared to high school students so they can learn about architecture through multiple avenues.